I’m sitting at a pastel green table on one of Italy‘s most beautiful piazzas watching people parading to and fro for an evening stroll. Children scamper away from their parents, a group of elderly gents stand in the middle talking politics, and young couples, coiffed and stylish, stroll about greeting friends and meeting for drinks. The waiter arranges a glass of chilled wine and a plate of nibbles in front of me and I sigh contentedly. 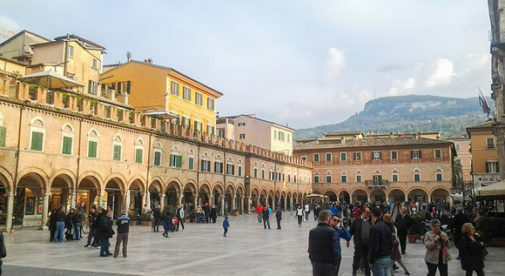 The travertine-paved piazza is lined with arcade-covered shops on two sides, anchored by a grand Gothic church on one end and the imposing Palazzo dei Capitani in the middle, where an art exhibition is taking place in the loggia-lined courtyard. Outdoor tables occupy space around the piazza, and I have chosen the historic Caffe Meletti for my drink, an elegant watering hole since 1881. I’m in Ascoli Piceno, at the southern edge of Le Marche, a gorgeous town with medieval monuments and Renaissance splendor, which is largely overlooked—but it shouldn’t be. Ascoli Piceno offers a high quality of life in its beautiful historic center, where everything you need for daily life is at your doorstep, and where events and exhibits regularly liven up the town. My husband and I were lucky to live in Ascoli Piceno for almost three years and we loved the rhythm of life, the shops, and coffee bars. Since it’s in a valley rather than occupying a hillside, a bicycle is the preferred way to get around town. We particularly enjoyed the ritual of the aperitivo, a pre-dinner drink presented with snacks, as a way to relax, get together with friends, and soak in the atmosphere of this historic city. The locals like to point out that Ascoli Piceno is older than Rome. Their favorite saying is: “Ascoli era Ascoli quando Roma era pascoli.” (Ascoli was already Ascoli when Rome was still a pasture.) They’re rightfully proud of their city and their lifestyle. It is beautiful and relaxed, and there is always something to do: an art exhibit among Roman ruins, cinema under the stars in a 15th-century cloister, concerts in the piazza, and a twice-weekly market that rolls into town. The velvet-clad opera theater is an opulent venue, while homey food festivals provide inexpensive (and delicious) fun. One of the highlights of the social calendar is the annual Giostra della Quintana, an event that harkens back to the 1300s and continues the medieval tradition of flag-throwing competitions, a grand costumed parade, and a high-energy jousting match on horseback that rivals the excitement of Siena’s famous Palio. When you fancy a change of scenery, you’ll find a range of options nearby. Ascoli is only a half-hour from the Adriatic Sea with its wide palm-line beaches, while the cooling altitude of the Sibillini Mountains is less than an hour to the west. Some of the country’s best vintages are produced in the nearby countryside, though many are unknown outside Italy. The elegant city of Ascoli, Italy offers an attractive lifestyle, fine restaurants, and beautiful scenery…all at a price which is cheaper than you may think. 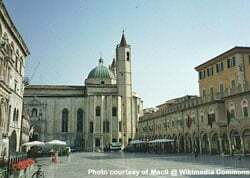 And, though Ascoli is a convenient and elegant city in the central swath of the country, near Umbria and less than three hours from Rome, it’s not as costly as you might think. Apartments in the historic center can be found for around $530 per month, and as I strolled to look at real estate listings I noted that prices have come down a bit since we lived here. I spied a pretty attic apartment with gleaming wood floor and beamed ceilings, nicely redone and ready to move into with the furniture included, for $163,000. Another place in the historic center, recently restored, had brick vaulted ceilings, exposed stone and a loft in addition to its bedroom, was on offer for $95,500, also including the furnishings. A nice townhouse with a terrace, two bedrooms, and a storage room in the character-filled lanes of the city is going for $184,000. In addition to the beauty and quality of life, Ascoli Piceno retains its small local shops, where fresh produce, locally raised meat, and regional products can be procured at good prices. Restaurants are plentiful, with excellent fare that won’t break the bank. You can dine out and enjoy a bountiful meal for about $20 per person. Despite all this, Ascoli Piceno is relatively unknown to vacationers. But while it may not be on the tourist radar, it should be top of your list of great places to live.